The Tay Bridge and Forth Bridges were commissioned by the North British Railway Company in a drive to beat it’s rival, the Caledonian Railway Company by providing the fastest route from London to the North of Scotland. In order to do that, the estuaries of the Tay and Forth had to be spanned, each requiring the construction of bridges longer than any ever built before and tall enough to allow passage of ships underneath. The first Tay rail bridge, connecting Dundee with Wormit in Fife, was designed by Thomas Bouch and built by contractors Hopkins Gilkes & Company. It opened in June 1878, however, disaster struck within 19 months when, on 28th December 1879, the bridge collapsed during a violent winter storm causing a train to fall into the water killing an estimated 90 people. The ensuing enquiry revealed the bridge had not been engineered to withstand gale force winds and that insufficient design coupled with poor workmanship had led to the collapse of the central piers and spans. The replacement bridge was designed by William Henry Barlow and William Arrol & Company, whose reputation had grown with the completion of the Caledonian Railway Bridge, was selected as contractor. The new design had to ensure that a similar disaster was not repeated and special care was taken to ensure the foundations and structure were of solid design. The foundations of the original bridge were found to be unreliable and so a new bridge was built 60 feet upstream, parallel to the original bridge. Unlike the original single track bridge the new bridge would have 2 railway tracks supported on 4 parallel lines of girders. It would be just under 2 miles long, consisting of 74 spans with a maximum gap of 79 feet to allow ships to pass underneath. Each span was supported on pairs of cylindrical piers which were joined by iron girders just above high-water level and at the top with a semi-circular arch which supported the main girders of the bridge . These piers had foundations 20 feet deep. 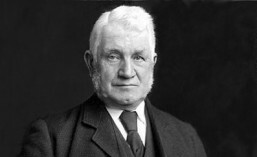 Between his tender being accepted in October 1881 and construction starting in June 1882, William Arrol utilised the time to plan the build, layout of the site and ensure that all the equipment required would be in place, including the invention and manufacturing of new equipment necessary for the more difficult aspects of the construction. 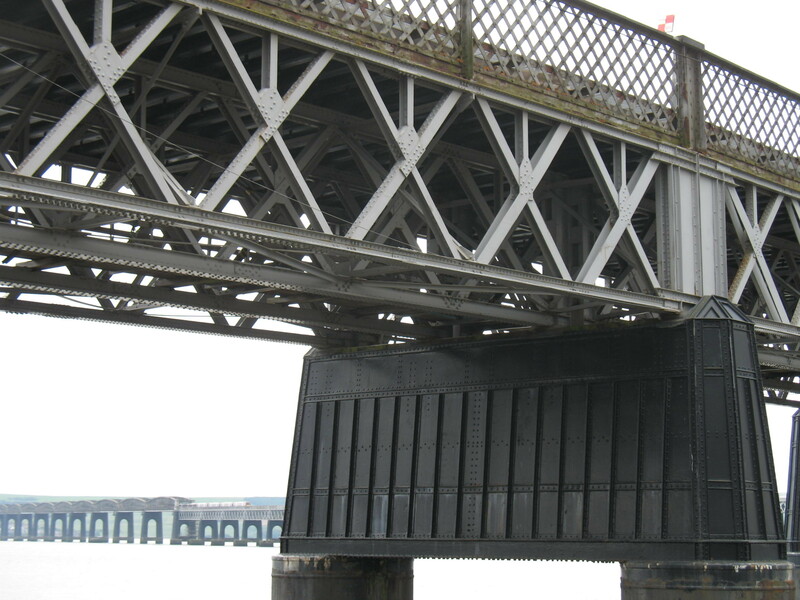 An example of this inventiveness was the way in which Arrol developed large scale use of the floating pontoons, which had been used successfully to build the South Esk Viaduct, adapting them to suit the construction conditions in the Tay Estuary. All the iron components for the bridge were made at the Dalmarnock Iron Works and transported to the works at Fife where they were assembled into bridge structures. 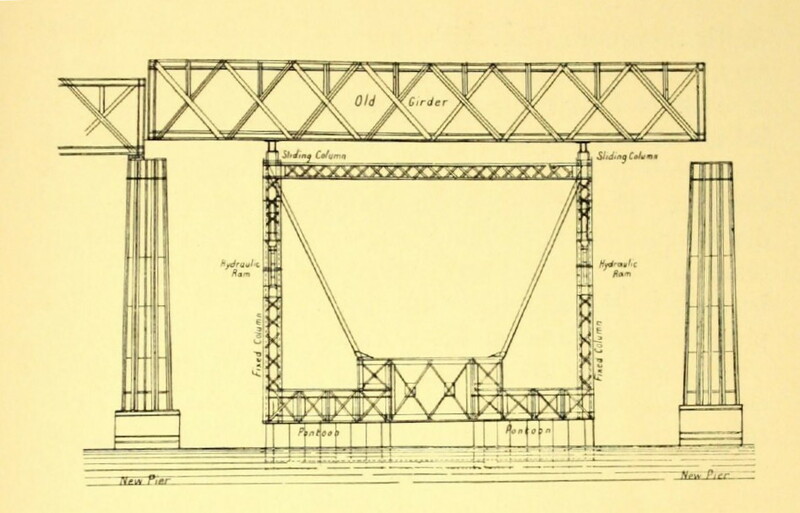 Sections of the piers constructed on shore were taken by barge to the floating pontoons from which they were moved into position, lifted by cranes and lowered by hydraulics. Many of the girders from the original bridge were reused and floating pontoons were constructed to transfer these from the old to the new piers. Entirely new girders were used for the 13 central spans. These were heavy lattice work structures which were built on pontoons in docks on the shore and then floated out into position, hoisted up onto their piers using hydraulic jacks. Most of the old bridge was removed but the bottom of the piers were left over fears that their removal might destabilise the estuary bed. The stumps of the piers can be seen today poking out the water beside the Tay Bridge. The number of men employed on the bridge varied from 600-1000, taking 5 years to build at a cost of £670,000. It was opened on 21st June 1887, the day of Queen Victoria’s Golden Jubilee. Despite the double celebration the ceremony was a quiet one, out of respect for the lives lost on the original bridge.